We don’t know about you, but we’re feeling 22!!! Or at least our friend Jenn is- she turned 22 recently and as per our usual custom, we wanted to make her some sort of delicious treat to celebrate. We almost always bake for birthdays, but for Jenn we really wanted to do something Pinterest-worthy. This is for a couple of reasons: first, she’s one of our very best friends (awwwww), and second, her 21st birthday was a little… *ahem*… “rough” for everyone involved and we wanted her 22nd to be stellar to make up for it! So to Pinterest we went! We found several birthday cakes decorated with different candies that inspired us. They were cute, seemed simple, gave us an excuse to eat both cake and candy, and were also super customizable. 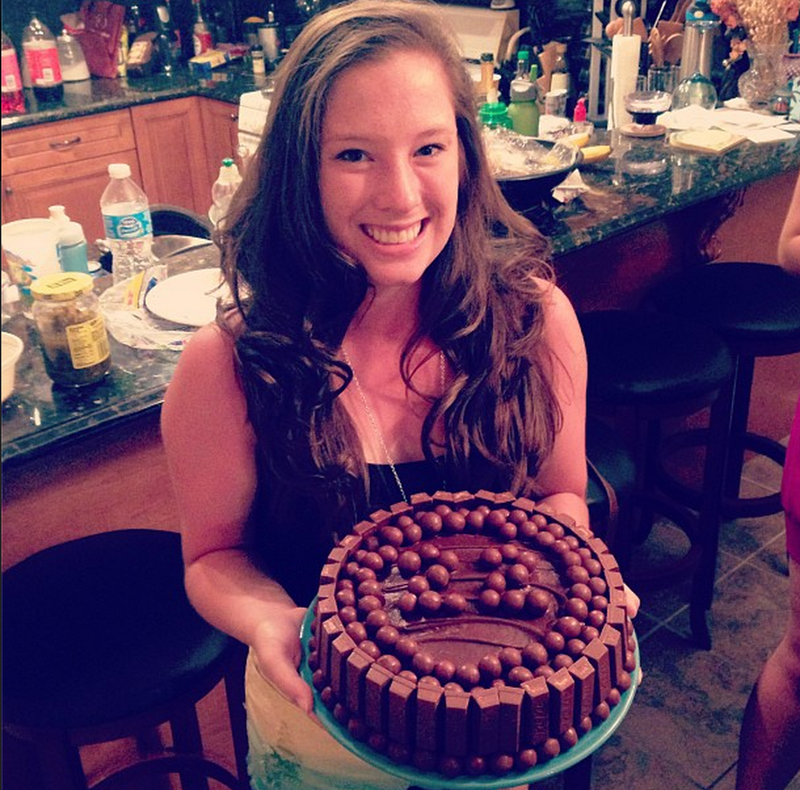 We decided to make Jenn a cake involving Kit Kats and Whoppers. Read on to see how it turned out! First, we gathered our ingredients. 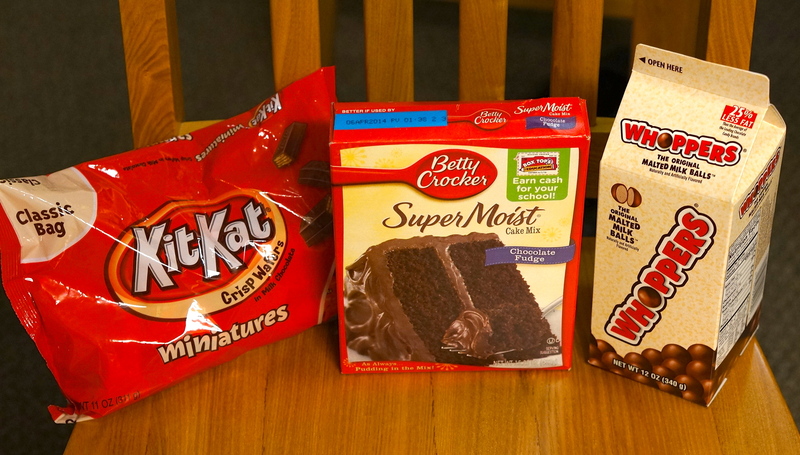 We used a chocolate cake mix, a tub of chocolate frosting, a box of Whoppers and a full bag of Kit Kat miniatures. Bake the cake according to the package directions in two round cake pans. 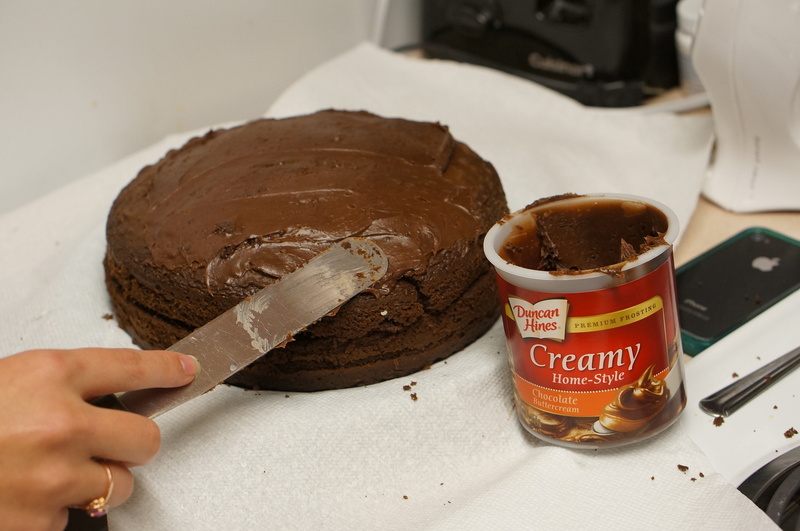 Use the chocolate frosting to stack the layers and frost the cake. Now you’re ready to decorate! We started with a ring of Whoppers around the bottom of the cake. Then we added the Kit Kats, standing vertically, around the outside of the cake. We planned on stopping there. but we had a ton of Whoppers left, so we got a little creative. 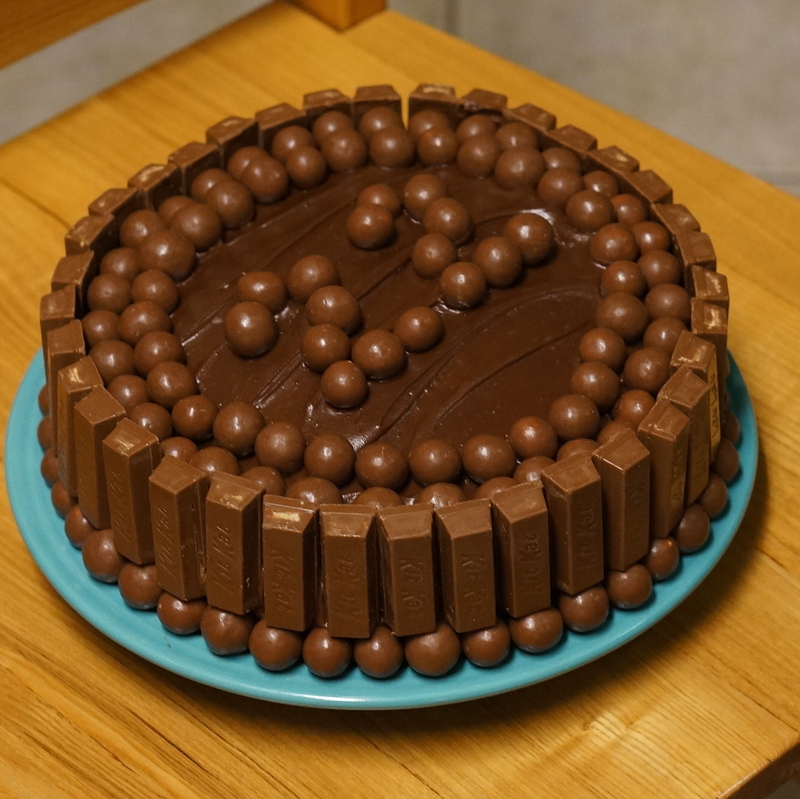 We added a couple of rings of Whoppers to the outside rim of the top of the cake (so they were sitting just inside the Kit Kats). 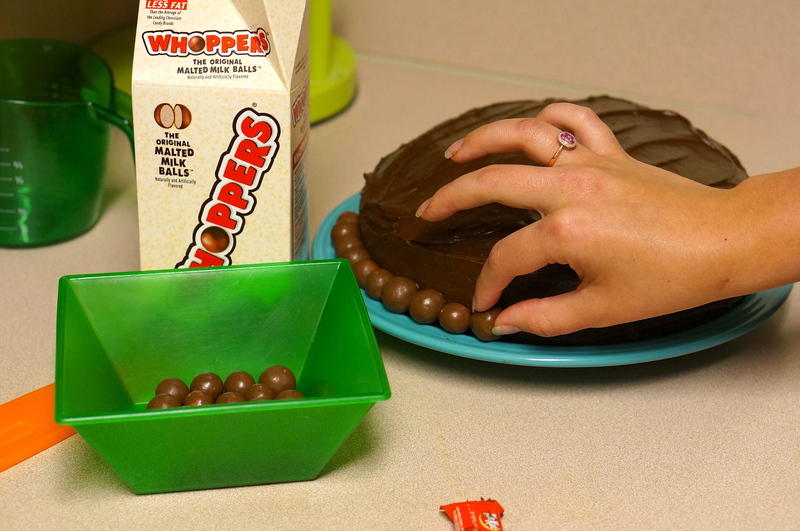 We then used the Whoppers as a cake topper to spell out “22” on Jenn’s cake. We were happy with how the cake turned out. Adding candy was a very quick and easy way to make a normal cake a lot more fun and personalized. Plus, we like that there are endless possibilities for this cake: you can add almost any candy depending on your preference (or the preference of the birthday girl/boy!). 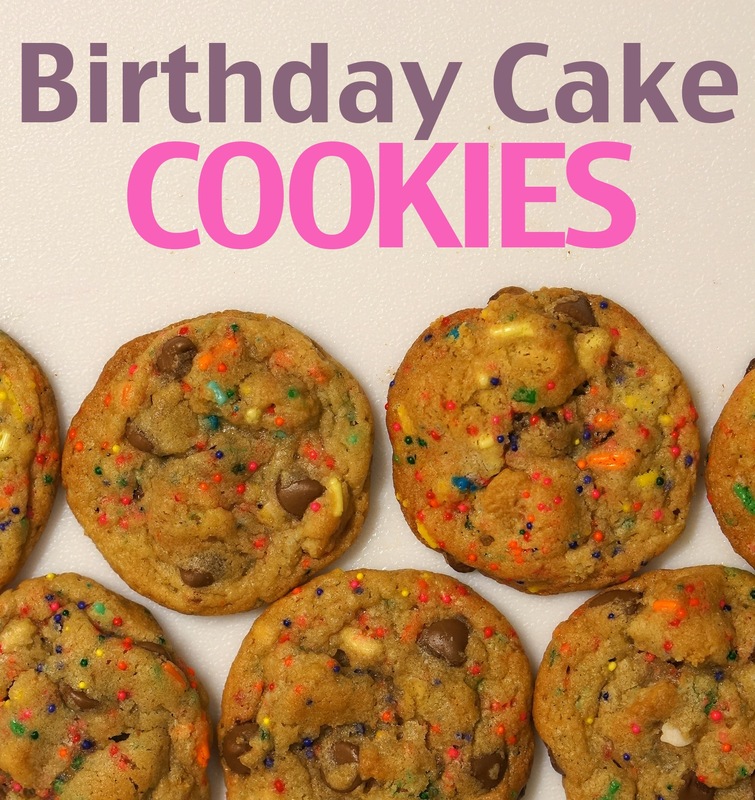 Check out some of our other birthday-appropriate shenanigans! This is a cake or any occasion!! Chocolate lovers dream cake!!! Awesome!!! Oh my gosh…this is the best birthday cake ever!!! Now that is an awesome cake! If you love chocolate you will LOVE this cake! The Kit Kat bars are a great addition.